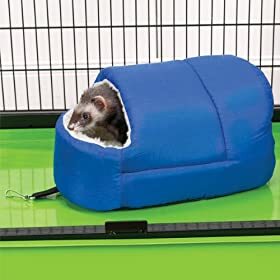 This cozy Ferret Bed is a great place for your ferret to curl up for a snooze. Bed has a soft berber lining. Attaches securely to wire cages with a metal clip. Keep your pint-sized pet happy and healthy with the Biddie Buddies line of small pet products. Innovative designs and coordinating colors let you create a safe, comfortable, and attractive haven for your pet. Check out our complete selection of homes and accessories for your little buddy. Biddie Buddies offers a complete line of innovative products for the safety and well- being of your small pet. Coordinates with the Biddie Buddies Collection of ferret products. These are great for pet rats too!